Who is the best president in US history? And the worst? The vision, the agenda of government, the internal and external leadership are some of the features that historians consider when evaluating the work of Presidents. Dr. Iwan Morgan , specialist in US history of the University College of London and Dr. David C. Eisenbach , expert in the presidential history of Columbia University, spoke about what they consider to have been the best and worst American presidents. Both elected five presidents as the most outstanding for their legacies in American history, and the first three places in their selection coincide with a survey conducted among 47 historians in 2010 by the Institute for the Study of the Americas, based in the United Kingdom. .
Morgan and Eisenbach also selected the leaders who have passed through the White House and who they consider may have a more negative legacy. Roosevelt ( Democrat) is considered by many to be the best president in the history of the United States, holding office for 12 years. His presidency was marked by two moments of great historical importance: the economic recovery after the Great Depression that the United States experienced. at the beginning of the 1930 s, and the involvement of the army of the United States in the Second War World (1939-1945) . 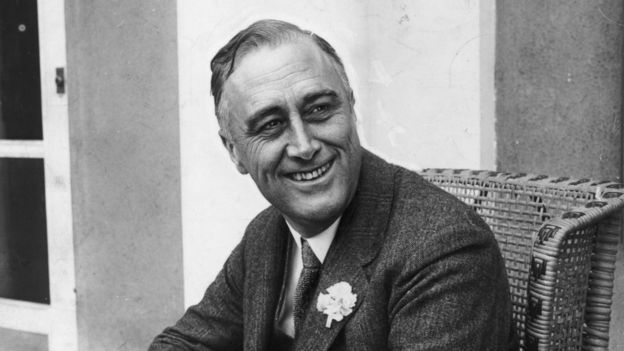 “He effectively invented the modern presidency and gave the Americans hope that his government would rescue the economy after the onset of the Great Depression,” says Iwan Morgan, who also notes that Roosevelt laid the foundations of the modern welfare state. Historians believe that during World War II, Roosevelt succeeded in keeping US troops out of conflict for as long as possible , while shipping armaments to the United Kingdom and the Socialist Republics (USSR). “He emerged as the key figure in the United Kingdom-USSR-USA alliance in World War II and laid the foundation for the creation of the United Nations,” says Morgan. When Abraham Lincoln (Republican) was president, the United States was experiencing one of its most traumatic moments in history, which could mean the disintegration of the country. The states of the Confederation declared their independence from the rest of the nation, largely because of the intention to abolish slavery , a measure supported by Lincoln . This sparked the Civil War (1861-1865), which cost the lives of more than 600,000 people. According to Morgan, Lincoln led the battle to keep the country together and made ” the statement that he was in favor of a peace agreement” . “He understood his leadership potential in times of crisis,” says the historian. His policy combined idealism with pragmatism because “he knew how to allow events to develop ,to push his agenda at the optimum time,” says Eisenbach. 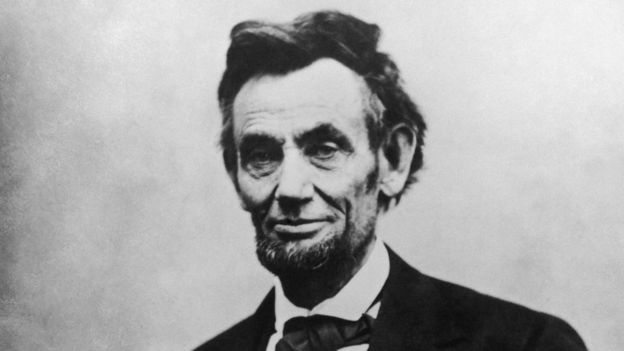 Lincoln managed to be re-elected but was shot in April 1865 by a sympathizer of the Confederates. 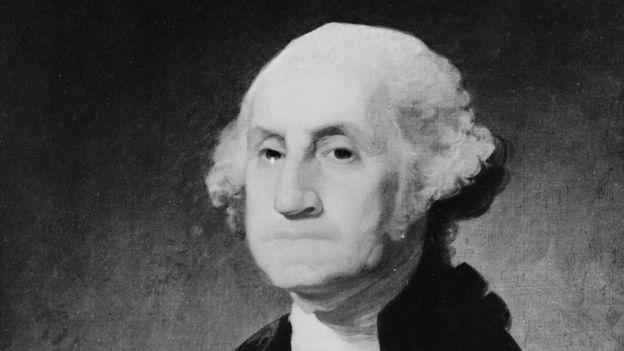 Washington is one of the founding fathers of the United States and was the first president of the country. He is the only leader who has won in all the states of the country after the approval of the Constitution of 1789, and he achieved it without any party flag. “Established and consolidated the presidency within the new constitutional order , helping to overcome fears of executive tyranny,” explains Morgan. There was no legal impediment for him to be reelected without limit, but Washington established the tradition that a president can only serve for two terms of four years, which became law until after the presidency of Franklin D. Roosevelt. Also under his presidency was the creation of the National Bank , one of the pillars for the economic development of the United States. 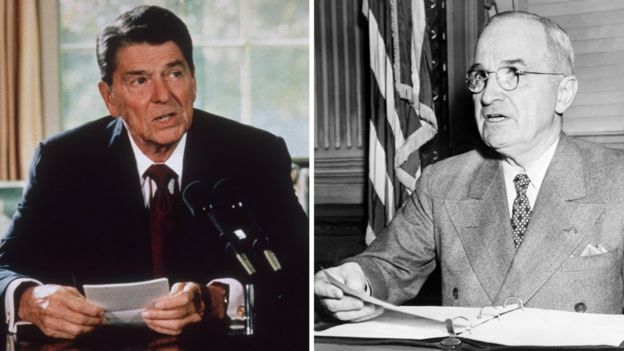 Morgan and Eisenbach proposed the best and worst US presidents, and Harry S. Truman (democrat) and Ronald Reagan (republican) are on the opposite list of each of the historians. For Morgan, President Harry S. Truman (1945-1953) was one of the best leaders because “he preserved the liberal legacy of the New Deal and expanded it through a commitment to civil rights,” in addition to supporting governments of Europe “threatened by communist subversion”. Truman was also the one who ordered the launch of the atomic bomb on Hiroshima and Nagasaki , which for Morgan was a step, “for better or for worse”, towards the end of World War II in the Pacific. Instead, Eisenbach blames Truman for starting the Cold War, between the United States. and the USSR , and notes that his government interfered in the elections of Western European countries such as Germany. Ronald Reagan (1981-1989) also divides both historians. For Morgan, he is the “most successful” conservative president the United States has had in the modern era. “He made low taxes an essential element of the nation’s political culture, knew when to be bold and when to take risks,” and also “rebuilt” the military power of the United States and laid the groundwork for ending the Cold War. In addition, he points out that he supported Saddam Hussein in the Iraq war against Iran, and the insurgent forces of Nicaragua, the “Cons”. The Columbia professor believes that in fourth place should appear Theodore Roosevelt (1901-1909, Republican) and the fifth John F. Kennedy (1961-1963, Democrat) , positions on the list of Morgan occupy Truman and Reagan. 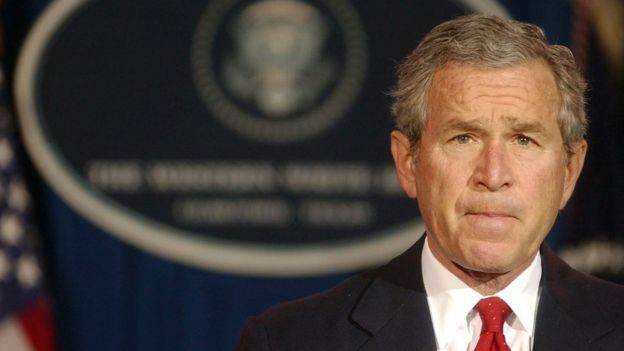 The president George W. Bush (republican ) is the one who is in the first position of the leaders with the most negative legacies of David C. Eisenbach. “For going to war against a nation ( Afghanistan ) that posed no threat to the United States and unleashing the forces that have destroyed the lives of millions of people,” says the researcher at Columbia University, referring to the movements jihadists who have emerged in the Middle East since then. He also notes that during his government there was “the worst economic crisis” since the Great Depression. In the survey of historians of the Institute for the Study of the Americas, Bush appears in the 31st place on the list of best presidents in the United States. 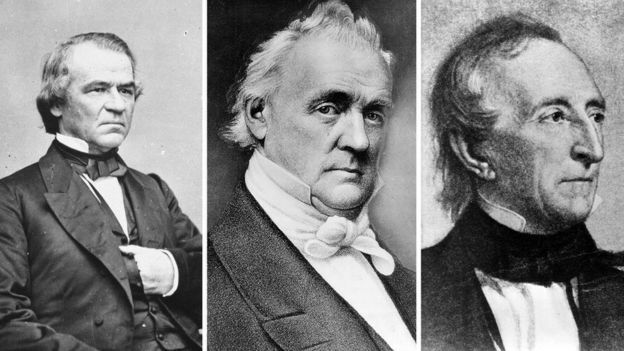 From left to right: Andrew Johnson, James Buchanan and John Tyler, presidents of the mid-nineteenth century. Morgan puts Andrew Johnson (Democrat ) at number one on his list of bad presidents, because he considers him the “most racist” in the history of the United States. “I wanted to preserve the south as the ‘country of the white man’ , obstructing the attempts of the republican Congress to expand the rights” of the blacks. Johnson was the first president to be accused of violating the law , for the removal of officials without endorsement from Congress, but he was exempt from responsibility since he was only convicted by 35 senators and not the 36 required. President James Buchanan (Democrat ) is accused of lack of determination to prevent the state of South Carolina from declaring his separation from the Union, one of the moments that preceded the Civil War. “A strong display of presidential determination could have stopped the growth (of the secessionist sentiment),” says Morgan, but instead Buchanan “surrendered” and left the military facilities in the south, Eisenbach complements. Described as a president who only defended the interests of the south of the country, John Tyler (Whig party) took his own agenda to become an active confederate in 1861. That is interpreted as a stance against the integrity of the United States , and in favor of the separation posed by the south. Although it was the president who achieved the annexation of Texas , after his separation from Mexico, he allowed the slavery system to be established there as that of the confederate states. President number 44 of US history, Barack Obama (2009-2017, Democrat) , was the first African-American to reach the White House. 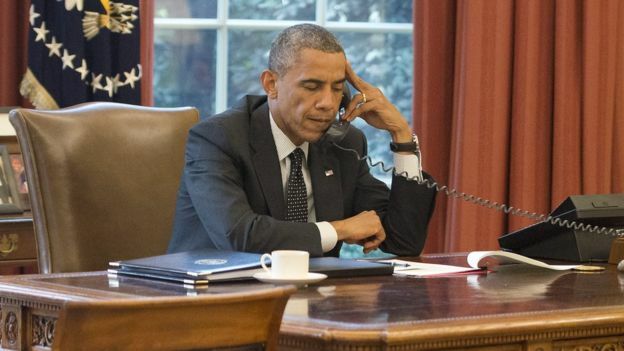 Both Morgan and Eisenbach agree that there should still be a few years so that you can have a perspective on the legacy of the Obama administration. The historians highlight among their achievements the removal of US troops from Afghanistan and Iraq , although “not in conditions that would allow the US to sing victory unequivocally,” thinks Morgan, who placed him in 15th place as best presidents. Eisenbach emphasizes that with Obama “the US achieved energy independence”. They also acknowledge that he made the necessary adjustments to improve the country’s economy , which he received “in free fall” in 2009 , but criticize that he has not applied the necessary punishments to those responsible for the Wall Street crisis. THE JURY IS STILL OUT ON CURRENT PRESIDENT, DONALD TRUMP.